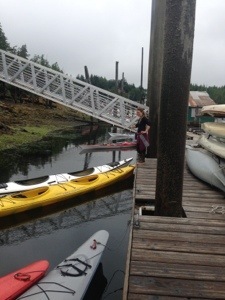 Arrived in Ketchikan this past Sunday the 21st! Decided to go big and push through so it ended up being a 30 mile day into town. Got in around 7pm and found a nice guy who let us store our boats on his dads dock right next to Salmon Landing in the center of town. We were worn out and starving but had to check in with customs and of course we had to get back into our boats and paddle to another dock to meet with the customs agent. Not too terrible though and soon we were off to O’Briens pub for a burger and fish n chips! I was super excited to be back in Ketchikan because I guided up here in 2010 at Southeast Exposure and it has been awesome catching up with Betsey, Jared, John and Jodie. We were lucky and able to stay in a guide house in town before paddling another 12 miles up to where SE Exposure is located at Knudson Cove! It wasn’t that far of a paddle from Prince Rupert to Alaska. Only took us 5 days to paddle 80 miles but it ended up being a little grueling. Definitely seemed longer than 5 days for sure! You are paddling in big water on this stretch. We were out in the Dixon Entrance and had the make a descent crossing over the Portland Inlet and from there you are pretty much in Alaska. We actually crossed into the U.S. on day 50 which was pretty cool One would think having the wind at your back would be awesome but not always. Everyday it was blowing out of the SW, giving us a crosswind which means our boats definitely did not want to track straight even with the skegs down. There were some big rollers to play in for two days which was awesome. Kelly’s skeg wasn’t functioning properly so she was hating life for a bit, and I was getting wet having to pull her skeg down all the time. Once we got within 40 miles of Ketchikan we started seeing tons of fishing seiners in the Revillagigedo Channel. It was pretty cool watching them pull up there huge nets and drop the fish down. We had a few more whale sitings too along. 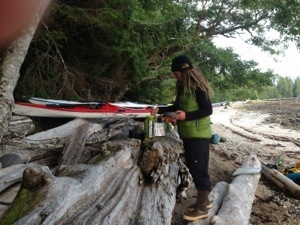 We saw one humpback and at this sweet campsite on the mainland we saw two orcas swim by. Also found more wolf tracks at this camp spot as well! I’m happy to report the bug situation has been much better too, woo! The 30 mile into Ketchikan was actually a pretty good day. Even though we were in the boats for 10 hours we felt like we were moving pretty quickly which normally doesn’t happen with 20 plus mile days. It’s been fun relaxing at SE Exposure. Got to have a proper bday celebration for kelly and met a lot new cool people and guides. We even got to run a kayak tour for them! 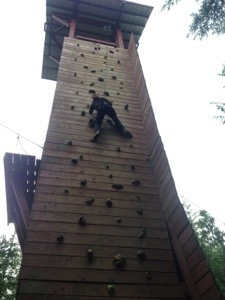 Oh and we also got to play on the climbing wall and run the zip line course on our own! It was good stuff! Big thanks to Betsey and the Southeast Exposure crew for letting us hang out for 4 days! Heading out toward Wrangell tomorrow morning!